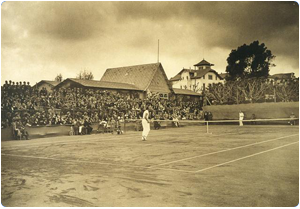 The Association of Centenary Tennis Clubs (CTC) is an umbrella group of clubs more than 100 years old, including some of the most prestigious clubs in the sport. Initially founded by eight clubs as a pan-European association, we now have an extensive and truly global membership and are recognised by the International Tennis Federation (ITF). All member clubs have a history dating back at least one hundred years, with a significant sporting tradition and social role. Our aim at CTC is to uphold the traditions of tennis, as well as the spirit of fair play which is inherent to this great sport. We look to achieve this through organising competitions and other sporting and cultural events; arranging tennis workshops and seminars; and generally supporting the activities of member clubs around the world. We also strongly encourage the development young talent. We give our support to a range of junior events, and seek to foster the future stars of the sport. This website gives some more information on our activities, as well as our member clubs. We hope you find it interesting. E. Gutzwiller & Cie, Banquiers, is a private bank specialising in asset management and investment advisory for private clients. It is proud to be a Partner of CTC.